Gives birds extra energy. Appeals to woodpeckers and other insect-eating species. 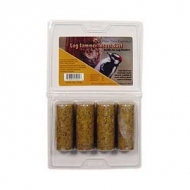 Ingredients include rendered beef suet, ground peanuts, finely cracked corn, dried insects. 12 oz.